To hell with unity… or rather the pretense of unity! Ujima (Collective Work and Responsibility) is different from unity! Collective Work and Responsibility is about individual dedication and action! Yes I espouse unity but the word is overused and is losing it’s meaning in our community! 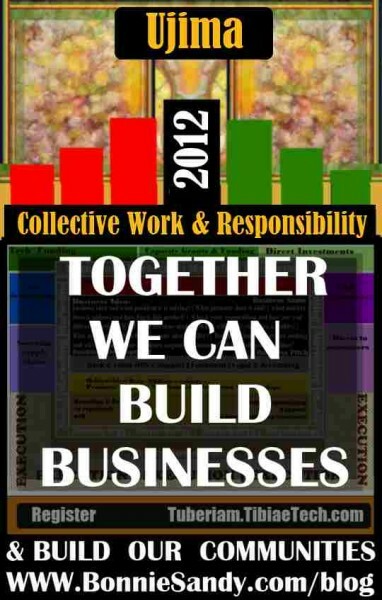 What I believe in is the effectiveness of collective work and responsibility. The challenge is identifying, defining and negotiating “Collective Work and Responsibility”. Working together much like world class teams to achieve common goals! As I prepped this I was interrupted by a call from my 87 year old mentor and found myself exhaling as one would to a grandmother! Between bouts of coughing (did I mention my love/hate relationship with NY winters) I found my voice, my center and a renewed determination to live truth! To others it means going along with the status quo … even while complaining that nothing has changed! Still to others unity means silence and keeping secrets that are killing our community! I encourage dissent… I’m the Chief Innovation Architect on the Tibiae Tech project and I challenge my cofounders and start up founders to challenge themselves, each other and even what I put forth. We cannot be afraid of opinions and must DISCOURAGE THE PRACTICE of “unity in thought” at any cost! What we stress is unity in MISSION, TIMING, PURPOSE & STRATEGY.. Collectively we are united that this needs to be centered in the community we seek to serve. The following was written in Dec 2009 and published on other blogs. It was part of a series addressing culture, creativity, community collaboration and commerce and the adaptation, adopting and integration of new media and web 2.0! Observations are solely my own personal views and assessment and I welcome any opportunities to convince me otherwise! Identify the task, the problem and more importantly target the specific goals you want to achieve. Collect information – DO RESEARCH! Organize, Process, Create a strategy and Review! Finally To quote Nike “Just Do It” … it is not going to magically happen! It is a creating a plan , And ACTING on It! Connect;- With each other, Buyers & Consumers to Showcase, Sell Inspire & Celebrate their African Heritage while taking on New Media and Technology! Next February Join Us as 28 Designers of African Heritage From around the World Take Center Stage…. Virtually !! That Is not Going To Be an Easy project! (It was not and it is STILL needed!) The Challenge is getting those of us who gripe and moan to take action! Part of the series on bridging the digital divide is making a connection between culture, creativity, community, collaboration & Commerce and how technology can help! These reflections on our cultural beliefs as manifested by Kwanzaa are part of that process! Identifying our brother’s and sisters problems:- UJIMA TAKES COMMITMENT Ok my focus is fashion designers as I am acutely aware of the problems in that area! But The simplest way to identify is ask… is their anything I can do to help… or offer, I am involved in Group A or B, how can we help! Space- This is tricky since every one assumes they can set up a “marketplace’ Funding/Financing- Simply Put designers would fair better if they are paid the value of their goods or products , Trade not Aid! ! Trust me most local designers will not make the same garment for two clients going to the same event! (unless it’s a wedding party) So you can share our information with your colleagues at work and church and on the job and on your social networks! These are broad based references to challenges… I have no problem getting into details but this it’ll take too long! UJIMA TAKES INGENUITY UJIMA; I understand it is second nature to me! I have been taught this since childhood! It a discussion my sister and I recently had we realized we are product of this doctrine! I am in the midst of planning a project that illustrates the subtle difference between Umoja and Ujima! We are pulling together 28 Designers of African descent around from around the world! The designers have a common goal and are working in unity to create a platform for their businesses that’s Umoja; that’s unity! When I say we; I have a team of local businesses and individuals who each have individual goals but this creates a platform whereby we all can contribute to building and maintaining our community together and make our brothers’ and sisters’ problems our problems, and to solve them together! That’s Ujima, Collective work and responsibility! Sony411 , AzizaPR, Colthom Photograpy, Makeup artist and Stylist Natacha Jospitre, have worked with our projects in the past and are committed to community; we now have tech sponsors and even some new individuals! The full list would be made public on January 2nd! Our aim is to get 28 designers, that’s a little tougher … not impossible, just tougher and it will take the virtues of all the rest principles to pull off! The reward however keeps us focused! 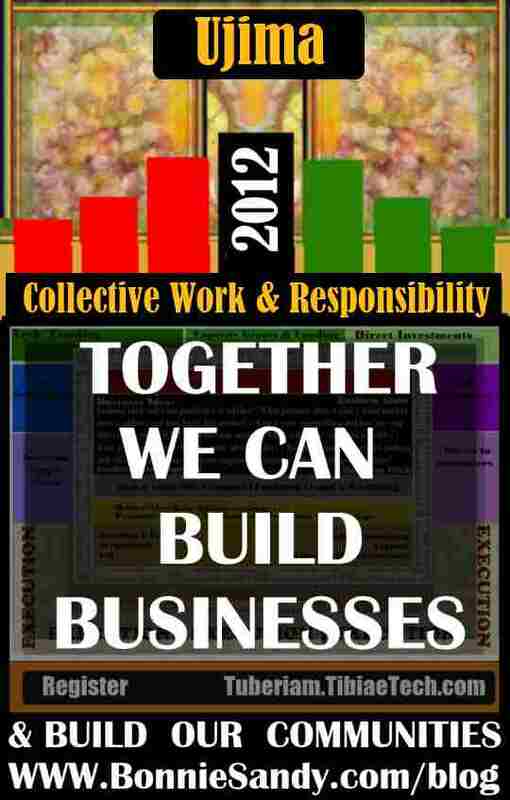 Collective Work and Responsibility is one of the few choices to a solution! We do these projects often; We’ve run tests over the last couple of years! It works… when each individual takes responsibility for their part, delivers their best and on time, it is a work of art! We have had instances when some have not pulled their weight! The greatest loss have been theirs as the others have simply stepped up and in so doing increased their skill sets! Too often we’ve had designers say, “I’ll wait”. In the last few months we got calls about a diversity pro gram that we were involved with that has been abandoned… We need to understand that time and opportunity does not always wait for us to get our schedules together!